Total length: 114 mm Weight: 60 g DBGM patent pend VPA suitability for use tested 100% made in Germany 10 Razolution DE-blades included! Designed and Made in Germany. 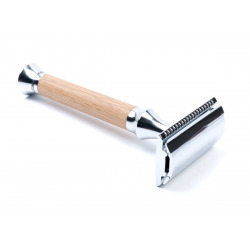 The handle is manufactured from solid olive wood, shaving head is made by zinc diecasting and fully chrome plated – 100% stainless. 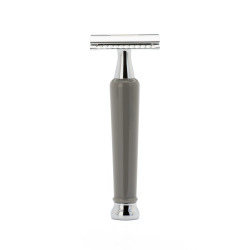 Due to its perfect balance, the safety razor gives you an all-time good shaving performance. Packed in a designed sliding box, including 10 Timor® razor blades, free of charge. Designed and Made in Germany. The handle is manufactured from solid oakwood, shaving head is made by zinc diecasting and fully chrome plated – 100% stainless. 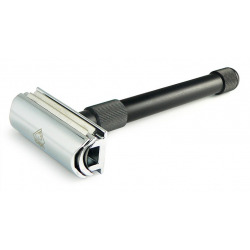 Due to its perfect balance, the safety razor gives you an all-time good shaving performance. 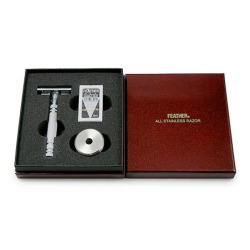 Packed in a designed sliding box, including 10 Timor® razor blades, free of charge. 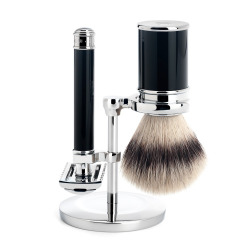 Made from 100% stainless steel the Feather AS-D2 Safety Razor is a work of art. This is a high precision razor, the razor is perfectly balanced so that the weight is in the head not the handle so you get meaningful feedback from the blade when shaving. Especially good for those looking for a non aggressive shave, this razor is an absolute joy to use.